2000 followers+ Theme Contest and giveaway! Hala wonderful readers! It gives me immense joy to announce that The Caged Bird Sings just crossed it’s 2000 followers’ mark. My blog completes it’s 8 months on the 21st of August. In less than 8 months, I’ve seen hundreds of reblogs, thousands of views, visitors and comments and tonns of love from my readers. I’d like to take a minute from this joyous moment to thank all my readers, visitors and followers. You’ve been steadfast pillars of support. This email was a response to my post The truth about happiness. James shared with me the story of how his brother overcame a depression that had engulfed him for 20 years! But when he did, there was no turning back. He wrote a book about the guide to health and happiness. The Theme for this Contest is “The secret of Health and Happiness”. Now you all know where is it inspired from. I’ve come to realize that these two are the ultimate elements we need in order to live. But unfortunately, they are the most ignored ones. It is not until you have certain ailment that you become alert. Why not prevent it instead. Above all, there’s no life without smiles! Health and happiness both go hand in hand. 1. Write a post* on the Theme and mention the link of this blog on your original post. 2. Drop the link of your post (once it is published) in the comment section of this blog post so that I can check the post. The best five stories would get an ebook Happy Guide Michael Kinnaird. * The post could be about your perception of Health and Happiness. Whether you have discovered them or are you still searching for it. If you’ve overcome some Health or emotional issues and want to share the story of it, it’ll be welcome. You could also share the story of you’re still suffering but are on your road to healing. Congratulations. I wish you the best, and 2000 more followers. Aap mujhe ye bta skti hai kya ki blogging community mai followers aur likes apney satisfaction ke liye important hota hai ?ya iska long time effect aapkey professional writing ke liye important hota hai.kyunki mai normally content pr dhyan deti hu .kya ye shi thought nhi hai? Content is very important. But it goes waste if not many people read it. Achha…Readers bdhane ke liye jo mere post ke content ko psand kre kya krna chahiye ?aap mujhe bta skti hai kya? Congrats Himanshu Shukla for achieving great success. Congrats Himanshi!!! What a cool way to celebrate too! It’s you all who make it great! Congratulations Himanshi. Is there a specific date to send the link? Because I’ve posted a post which should remain there for a few days. PS. Would you read my latest post please? Ohk. Send it within 4-5 days. Is it fine for you? I have earlier written a blog on happiness. Congratulations Himanshi and best wishes for many more successes on your blogging journey! 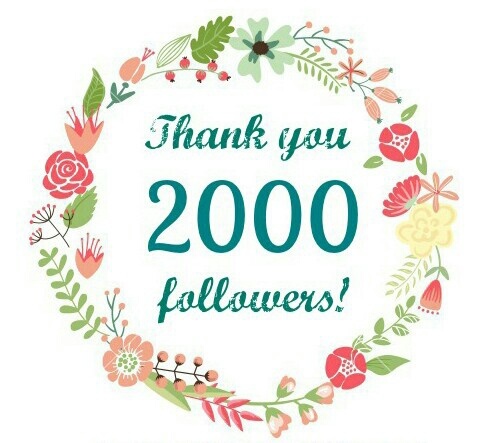 Hi Himanshi, congratulations on reaching 2,000 followers — that’s quite an achievement in such a short space of time! I love your idea of asking for “health and happiness” posts and stories. I can’t wait to read them! I myself was overwhelmed to do the giveaway. Thanks for giving the opportunity! Thanks Himanshi and you are very welcome! Being jealous is just a human quality! I’d like you to participate too. How nice you have achieved to reach so many people with your excellent blog Himanshi. 2000 followers in 8 months is a lot of people! Congratulations and thank you indeed. I will keep following your blog and enjoying it. Seriously, thank you so much for the love!! Do you have an Instagram name? I wanna post about you on my instagram author page!